Responding to a request for proposal (RFP) is a standard step in the buying process. With RFP responses, there are always opportunities to improve the quality of your content and improve your conversion rates as a result. 90% of successful marketers at B2B companies prioritize the audience’s informational needs over a sales/promotional message. The introduction of an RFP response involves a cover letter and an executive summary—these sections offer golden opportunities to develop content that is laser-focused on your prospect’s needs. RFP responders commonly use cover letters and executive summaries interchangeably, when they are, in fact, two different sections. Confused about the difference between an RFP cover letter and an executive summary? Not sure if you need both sections? Not sure which section comes first? Let’s help you fully understand the nuances of the RFP cover letter and the executive summary, so you can get a strong start with your RFP response and improve your organization’s chance of landing the deal. What is an RFP Cover Letter? First up is the RFP cover letter. For positioning on your RFP response, this section should come before your executive summary. A cover letter should be no more than one page in length. An RFP cover letter is a conversational introduction at the beginning of your RFP response. Similar to a cover letter you submit for a job opportunity, this letter is your chance to tell a little bit about yourself and why you’re the best candidate. It is almost always a requirement of an RFP, even if the issuer does not include a specific section. States that you are bidding for their business by responding to the RFP. Reiterates details from their RFP (i.e. company name, service/product requested). Explains why your organization is qualified to respond to the RFP. Reveals key benefits they will experience while working with you. Lists anything you are providing in your RFP response. Demonstrates your excitement for the potential partnership. An excuse to jump into a salesy spiel about your product or service. Formatted with images or headers…it’s a letter with a greeting and sign-off. The time to go into great detail about your strategy or execution. The goal of your RFP cover letter is to eloquently introduce your organization as the right partner. By the time the issuer reaches the last sentence, they should feel confident about spending their time reading the rest of your RFP responses. 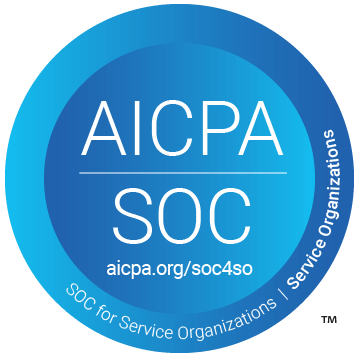 I speak on behalf of the entire [RFPIO] team in saying how thrilled we are to have been selected to respond to an RFP to become [Company]’s preferred partner for [Company – service or product need]. Included in this RFP, you will find responses that meet and exceed your requirements along with the [Company – additional materials] you requested. Should you need any other information to move this process forward and further validate your decision, please let us know. We are grateful for this opportunity with [Company]. What is an RFP Executive Summary? Next is the RFP executive summary. For positioning on your RFP response, this section should come right after your cover letter. Like a cover letter, an executive summary should be no more than one page in length. An RFP executive summary is a high-level statement after the cover letter section in an RFP response. This statement is your offer to the decision-makers, a chance to address your buyer’s needs and goals directly. The executive summary is optional, and not a requirement of an RFP. Providing an executive summary can put your organization at a competitive advantage, giving you more room to explain the benefits of working with you. Hooks the buyer with an opening statement about your solutions. Explains how your solution benefits the market as a whole. Uses storytelling to convey your company’s mission, history, and purpose. Demonstrates the impact of your solution, including expected results. Includes optional images that support the content. The cliff notes of your entire proposal. Formatted like a letter…it’s a statement. Several pages of client testimonials or stories—stay focused on this prospect. Why should this prospect select you as their partner? By the time the RFP issuer is finished reading your executive summary, they should strongly consider the partnership possibilities already before reading the rest of the RFP. A cover letter tends to be more straightforward, while executive summaries are more complex. Because there was such a demand for executive summary resources for response teams, we created an RFP executive summary template that gives you the building blocks for writing more effective content. Content is engrained in all of our business processes. RFPIO enhances collaboration and fosters a truly efficient and effective response process with a response management platform that is built to encourage collaboration and create winning responses. Even in today’s highly technical business environment, 84% of responders are still using a manual process to manage business queries across the organization, which directly impacts resources and the ability to achieve revenue goals. To ensure your organization’s success, our cloud-based software platform is suited for efficiently responding to all types of business proposal documents—RFx (RFP, RFI, etc. ), statements of work (SOW), security questionnaires (SIG and CAIQ), grants, along with marketing and sales content. Before founding RFPIO, we were RFP responders that worked overtime to meet deadlines too. 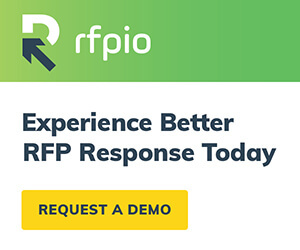 This experience led us on a mission to create RFPIO, which is now the leading solution in response management—helping companies streamline their proposal efforts, provide high-quality responses, and create additional revenue opportunities. We know that for [Company] it’s paramount to improve process consistency and team efficiency, while gaining more insights and visibility into RFP response activities across your organization. With RFPIO as your team’s response management platform, we feel confident that you will be able to achieve your goals within a secure and scalable solution. We hope this breakdown of the differences between the RFP cover letter and the RFP executive summary helps you create a more compelling intro. When in doubt, think about the RFP issuer’s informational needs…and keep the content short and impactful. 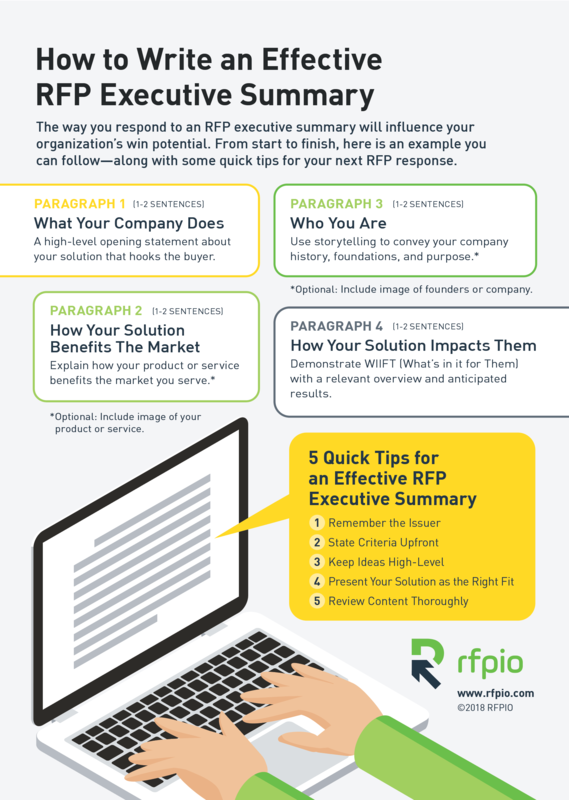 Creating high-quality RFP cover letters and executive summaries is easier with RFPIO. Sign up for a demo to see how it works. As the Senior Marketing Manager at RFPIO, Kylie is passionate about increasing business effectiveness and efficiency through software solutions. She works with a talented team of professionals to create resources that showcase RFPIO’s ability to optimize the response management process by empowering teams to create the highest quality of responses in the shortest amount of time. Kylie has 15 years of global B2B marketing experience in the technology industry working for startups and Fortune 500 companies. Connect with Kylie on LinkedIn.